OITA - Rescuers have found a third body at the site of last Wednesday’s massive landslide in Oita Prefecture. 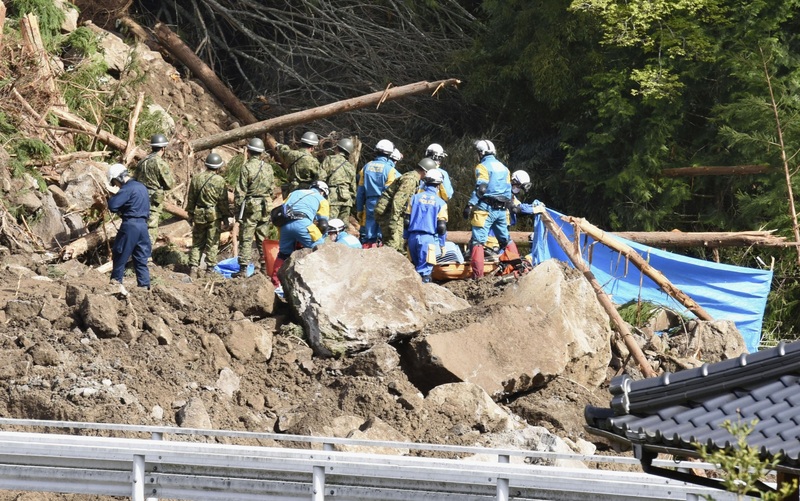 The body was found Sunday night partially buried in mud near the home of Yu Ebuchi, 21, one of four persons listed as missing after the landslide in the mountainous Yabakei district in the city of Nakatsu, according to the Oita Prefectural Government. Officials said the latest body has yet to be identified. The mountain slope collapsed at around 3:50 a.m. Wednesday, engulfing four houses. 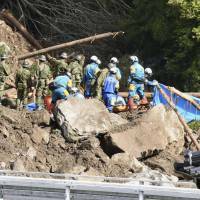 The bodies of two people — Aiko Iwashita, 76, and her 45-year-old son, Yoshinori — were recovered last week. Some 500 personnel took part in the search and rescue effort that resumed Sunday afternoon after a hiatus of nearly a day caused by bad weather. While mudslides are often triggered by heavy rain or earthquakes, neither were reported in the area at the time. The Nakatsu Municipal Government has issued an evacuation order for 26 residents of 10 households.